(Beyond Pesticides, May 3, 2018) Hawaii’s bill to ban the dangerous, neurotoxic pesticide, chlorpyrifos, passed its final hurdle this week in the state legislature. Governor David Ige is expected to readily sign SB3095 into law, in light of the unanimous support it received from lawmakers on both sides of the aisle. The statewide prohibition of chlorpyrifos will take effect beginning in January 2019. This legislative action marks the first time that any state in the country has passed an outright ban on the highly toxic organophosphate pesticide. While multiple scientific studies have determined that chlorpyrifos damages fetal brains and produces cognitive and behavioral dysfunctions, particularly in utero and in children, states have been slow to institute a complete prohibition, due to its widespread use in agriculture. Lawmakers in New Jersey and Maryland have recently tried unsuccessfully to pass similar bans. Hawaii’s bill contains a caveat that allows the state’s Department of Agriculture (DOA) to grant special permits for companies that argue that they need more time to phase-out chlorpyrifos, but that exemption will end at the close of 2022. The new law also requires restricted use pesticide (RUP) users to report to the Hawaii’s DOA which ones they are applying on their land, crops, and in orchards, how much, and when and where they apply the chemicals. That information will be aggregated by county and publicly released in summary report on an annual basis. Such aggregated data enables researchers and policymakers to track yearly pesticide use trends by county and it can inform the development of public and environmental health protection policies. But, according to Maui community activist, Autumn Ness, legislators substantially watered down the pesticide disclosure provision in SB3095, which was previously a robust, stand-alone bill. Instead of allowing public access to pesticide use data on an as-needed basis, which was what the advocates wanted, the bill requires DOA to only provide a summary of aggregated statistics on an annual basis. Since Hawaii is ground zero for chemical industry experimental testing of pesticides on cropland, the public has argued for the right-to-know what they are exposed to when pesticides drift off of test sites. Ms. Ness laments that this weak pesticide disclosure requirement will not automatically or easily allow communities to access site-specific data in instances where suspected acute exposures arise. Instead, the only way individuals or organizations may be able to view specific user data in a distinct location is to file a Universal Information Practices Act (UIPA) request, which legally requires an answer from DOA within 10 days but, in reality could take much longer, depending upon what is asked of the agency. This delay would not be helpful in cases of acute exposures. In addition, the bill establishes a small schoolyard buffer zone, prohibiting companies from spraying highly toxic, RUPs within 100 feet of schools while they are in session. Similar to what happened with respect to the pesticide use disclosure provision, a strong, stand-alone pesticide buffer zone bill was originally introduced. It was added to the chlorpyrifos ban bill and severely weakened. The original provision was modeled on California’s pesticide buffer zone law. California’s law requires a quarter-mile pesticide exclusion zone around schools when they are in session, versus the 100 foot exclusion zone contained in the Hawaii bill. The only real similarities between the two is that they allow pesticides to be used near schools when they are not in session. In both cases, this could result in pesticides being sprayed during sporting events or other outdoor community activities that often take place on school campuses after hours. Public pressure to prohibit chlorpyrifos has mounted in recent years due to increasing scientific evidence, which shows that even at low levels of exposure to pregnant women results in impaired learning, change in brain functions, and alter thyroid levels of children into adulthood. Females are especially at risk. A study conducted by the Columbia University Center for Children’s Environmental Health (CCCEH) found that chlorpyrifos in umbilical cord blood samples corresponded with a decrease in the psychomotor and mental development in three-year olds. Additional data collected by CCCEH researchers demonstrated that children exposed to high levels of chlorpyrifos experience developmental delays, attention deficit, hyperactivity, as well as other pervasive developmental disorders. Knowledge of these gross impacts on developing fetuses and children motivated community members across the Hawaiian Islands to speak out against the use of chlorpyrifos and other pesticides near schools and to educate state lawmakers about their dangers. It took several years to create a groundswell of public support for the ban with people regularly speaking out against chlorpyrifos and other RUPs. Multiple court battles ensued, as did a relentless, high profile public campaign, backed by strong and unyielding leadership from key legislators. 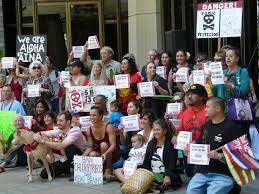 This quest for advancing public health in Hawaii above economic interests is far from over, and statewide health and environmental advocates do not plan to wallow in their victory for long. In fact, this week, in the face of strong public pressure, the state legislature passed a SB2571, which bans the sale and distribution of sunscreens containing oxybenzone and octinoxate. The chemicals are toxic to developing coral reefs and increase the coral’s susceptibility to bleaching. They also have been found to damage DNA in adults, according to study of the chemical’s effect on reefs in Hawaii and the U.S. Virgin Islands. Once the Governor signs the bill, which is expected, it will take effect on January 1, 2021. And, again, Hawaii will lead the nation as the first state to ban toxic chemicals in sunscreen. To oppose the continued allowance of chlorpyrifos and other noxious pesticides in your community, write or call your US Congressional Representative. Urge them to support the Protect Children, Farmers, and Farmworkers from Nerve Agent Pesticides Act of 2017 to safeguard schools, neighborhoods, and workplaces from the unnecessary exposure to this neurotoxin. Learn more about the fate, effects, and impacts of pesticides, including chlorpyrifos, by visiting Beyond Pesticides’ Pesticide-Induced Diseases Database. Also, consult Beyond Pesticides’ factsheet Children and Pesticides Don’t Mix, which cites peer-reviewed scientific literature on the health effects of pesticides. This entry was posted on Thursday, May 3rd, 2018 at 12:00 am	and is filed under ADHD, Agriculture, Autism, Children, Children/Schools, Chlorpyrifos, Environmental Protection Agency (EPA), Farmworkers, Hawaii, Uncategorized. You can follow any responses to this entry through the RSS 2.0 feed. You can skip to the end and leave a response. Pinging is currently not allowed.